i'm 25 have had mild acne for last 10 yrs. 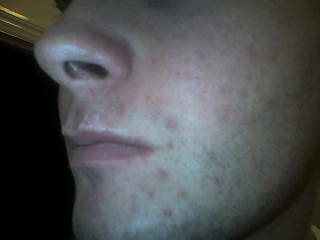 Family has bad acne, my brothers was alot more severe than mine and he took accutane around 10yrs ago and it worked really well for him. I have tried most things, 3 or 4 different courses of anti-biotics, topicals. what i found works the best is benzamycin(but still not good enough), i have been using that on repeat prescrip for 5 or 6 years now on and off, but i have still never had a clear face for over 10years...never. The only time i came close was when i tried the b5 supplement for about 4 months, i found it worked well initially but by the 4th month my skin was really oily again and i was having breakouts again. My skin is very oily on my forehead, nose and chin. My main area of concern is my chin, i get large cyists there once a month, they can be very large and by the time they are startin to heal, another one comes along. I have attached a pic for you to see, i know its mild but its constant and enough to effect my life. I dont know whether its severe enough for accutane...where do i go from here?? your acne is pretty mild though.. Cheers, i know its mild but its still bad enough to stop me leaving the house! yeah, i understand..just explain how it is effecting your life to your derm and he will prob put u on it.. Sounds similar to me mate. 27 next month, had mild acne for 9+ years. Been on and off antibiotics for all this time. Just want to be able to live without the antibiotics but I just break out. Acne in men is ment to go after 25years on average so I guess you just have to wait. My acne is similar to yours but I don't want to go on accutane now. Had I known then 5-6 years ago I would have! i Dont think it will go after 25, my family have all had it, my uncle still has it really bad at 40. I'm gonna get a doctors appointment this week and just ask them what the next stage is. I have pretty much decided i want to try accutane - take the chance - as i dont want to go through another long weekend as depressing as that one was. i dunno whether they will send me to a derm or not, but the doc treatment aint working. Wouldn't send me to a derm. i got a prescription for isotretinoin, not sure what thay is. Anyone tried it? Not sure what isotretinoin is, out of interest have you tried a glycolic peel? Im 29 and have very mild acne, well the occasional Zit but plagued with red marks. Never tried the peel. I am the same, plenty of red marks. i feel my skin in very sensitive thats why i have never tried anythin like this. I was thinking of trying a fake tan to try and cover some of it up but i think the topicals i'm using would just bleech it back of. has a peel worked for you? Its a topical cream he has prescribed, i never knew you could accutane in a cream. is it any good? The thing that annoys about topical treatments is i'm 99% sure my spots are caused from factors inside my body leading to extremely oily face. And although topicals help they are not targeting the problem - excess oil. I feel like i'm treating the symtoms and not the cause. When i was on b5 and it stopped my face being so oily my face was the clearest it had been in years. After a few months on that it came back tho, and tbh i wasn't to keen on mega dosing for any great lengths of time. might think about buying some accutane of the internet. Damcal, i have been using benzomycin for years now so its pretty similar to regimen. again tho, your putting bleach on your face to treat the symptoms not the cause. The regimen will not stop my over oily face which i am equally concered about. If you stopped the regimen, i imagine your spots would return. I go to the toilet everyday at about 11 before lunch to pad down my face with those thick bathroom paper, the ones for drying your hands, i open it up, hold it to my face, when i take it off you can clearly make out my face in the towel! Turn it over and the most of it has went right through the other side! So although my problem is primarily spots my secondary problem is lowering the amount of oil my face produces. Jeffh, what dosage were you taking?